You are at:Home»Campus»Who Ya Gonna Call? On any given night, you might find the Brown University Emergency Medical Services ambulance with its lights flashing outside a campus building, while student EMTs care for someone inside. Calls range from tick removal to anxiety to severe allergic reactions. Brown EMS was founded in 1978 by students, and is one of the oldest collegiate EMS systems in the country. The service is run almost entirely by students: around 80 undergraduates volunteer throughout the year, with Alpert medical students, firefighters, and professional EMTs serving as their supervisors. Varone became a volunteer firefighter in Exeter, RI, at age 16, and received his EMT certification in 2009, the summer before his sophomore year. His Brown EMS co-supervisor, Jack Ludwig MD’16, and co-instructor Shane Petrites MD’18 were certified as paramedics before coming to Alpert Medical School. There are two main categories of prehospital care providers. Brown EMS undergraduates are certified as Basic Life Support (BLS) providers, meaning they can give some medications but can’t start IVs or administer potent analgesics. Advanced Life Support (ALS) providers, such as paramedics, can give IVs and myriad medications; the EMS supervisors all have ALS certification. Some calls, like ankle sprains, only require BLS providers, while anaphylactic shock and cardiac issues require ALS providers. Dan Resnick-Ault ’09 MD’15 was the first Alpert medical student to work at Brown EMS as a supervisor; but he joined the group as an undergraduate, in 2005, volunteering as a BLS provider and teaching skills to fellow students. “EMS taught me many of the practical skills that are often missing in medical education—simple things like putting on the electrodes for a 12-lead EKG, starting an IV, applying defibrillation pads, and administering medications,” Resnick-Ault says. 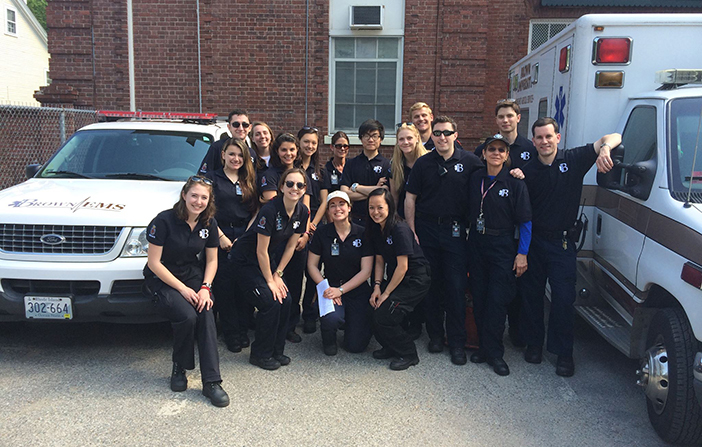 Amy Sanderson, the Brown EMS manager and service chief, who coordinates the summer EMT training courses, says medical student supervisors enhance the program for undergraduate volunteers. “Whenever we’ve been able to get med students, we’ve had med students do the anatomy and physiology portion of the summer course,” she says. Supervisors have lectured on anatomy, cardiac and respiratory emergencies, shock, resuscitation, and other topics. A unique part of Brown’s EMT course, Sanderson says, is the medical student-run cadaver lab. In June, seven medical students used cadavers from Alpert Medical School to explain anatomy and physiology basics to undergraduates, highlighting areas particularly important for prehospital care providers, such as the airway. The supervisors also mentor informally, by working shifts alongside undergraduate volunteers. “Medical students are in a position that many of our EMTs are seeking. 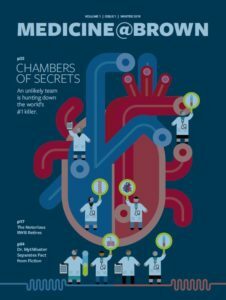 … They can talk about what medical school really is, as opposed to what you think it is when you’re applying,” Sanderson says. Resnick-Ault, who moved to Boston in May to begin his emergency medicine residency, says that mentoring undergraduates was his favorite part of working at Brown EMS. “I love teaching, so I really enjoyed putting crews through training scenarios at the beginning of each shift—often tough ones to stress the importance of efficiency, teamwork, and quickly establishing treatment priorities,” he says.